The City of Austin recently participated in a program with the National League of Cities and C&NN to look at all the policies and practices they follow, or could improve, to connect children and families with nature. Through a mapping exercise, the City discovered that several low-income, high density communities where lacking in accessible parks. They were also lacking in land to add new parks. This was a problem considering the City has a policy that says all citizens should live within a quarter mile of park. The solution? Rethink public school campuses as community parks during out-of-school-time. The Green School Parks concept was conceived, and later implemented in the Runburg community of Austin to install three demonstration sites at schools that had a joint use agreement with the City of Austin. Each school went through an extensive community engagement process to discover how the citizens living around the school wanted to use the lands if they were open to them. Then the kids where engaged to include their ideas. The results where merged with several park and school campus design best practices to create the first demonstration site at Barrington Elementary School in Northeast Austin. Improvements included a pollinator gardens, rainwater catchment system, outdoor classroom, looping pathways, and more trees for shade. The community was invited to enjoy their new park and attend programs led by local non-profit partners. Teachers received training on how to utilize the entire campus, not just the indoor spaces, as a classroom. Not every school has a Joint Use Agreement with their city, nor can they all go through the Green School Parks process. However, they can activate their big, beautiful school campus with outdoor programs such as- a Campus Campout. Hosting a campout is a great way to build community engagement, develop outdoor skills, and have fun. 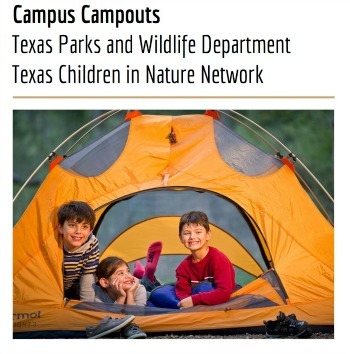 The Texas Children in Nature network and Texas Parks and Wildlife Department have put together a step-by-step guide to help schools plan and execute a campout without having the burden of transportation costs. Schools can download the free Campus Campout Guide and start planning an even for this fall or in the spring. Research shows when children learn and play in nature they are healthier, both mentally and physically, more cooperative with others, better problem solvers, feel more confident and perform better in school. In short, they are healthier, happier and smarter. Looking for curriculum to get kids outdoors? Have a look at the Learn page of TCiN's website or on the NatureRocksTexas website in you community to find cool curriculum and ideas. Please note that TPWD nor TCiN are able to come out to lead a Campus Campout in every community, however they do hope to be able to connect schools with the idea and resources need to take action.